The NJDOT has reviewed PRT systems in the past and concluded that there is currently no practical application for these types of systems on either State or Interstate highways. Thank you for sharing the information provided to Mr. Dube. c. It is in the State's economic interest to investigate new types of service which may improve the usefulness and integration of existing platforms, provide fast, inexpensive travel options, reduce capital costs of projects, and reduce pollution from motor vehicle travel. Personal Rapid Transit (hereinafter “PRT”) is one such technology currently being made available. d. According to the Federal Transit Administration, average capital cost per two-way mile for heavy rail is $150 million, and for light rail is $70 million. For operating cost per passenger mile: heavy rail is $1.20, light rail is $1.80. However, PRT has the potential to cost 37 much less than heavy and light-rail applications, carry high capacity, be flexibly located, and require much less physical "footprint," potentially reducing easement impact for currently scheduled projects. PRT studies have shown a capital cost of about one-tenth the cost of existing rail technology, with similarly low operating costs. We the People, form governments to coerce compliance to law. The Governing do not hold themselves accountable for violating laws. Any priviate company would be subject to criminal charges with the safety record of NJDOT. Yet the Governing in New Jersey use police powers to protect their commerical monopoly from free market competition and to declare sovereign immunity for their safety deaths. Sovereign immunity should be removed. Background on the nature of government, the Monopoly of Violence. The validity of these statement is proven by the 110 million oil-free, injury-free passenger-miles achieved by the PRT network in Morgantown, WV. The Morgantown network pays for itself about every 5 years (independent audit). $13.4 billion per year for gasoline (462.9 trillion BTUs, 114,500 BTUs/gallon, $3.30/gallon). Since opening in 1975, the PRT network in Morgantown, WV has delivered 110 million oil-free, injury-free passenger-miles. Morgantown's PRT is self-regulated, so it does not have a viable standard that can be applied to new systesm. However, the ASTM International standards from the theme park industry has a safety record approximately 80,000 times better than DOTs, well established insurance, and inspection enforcements. 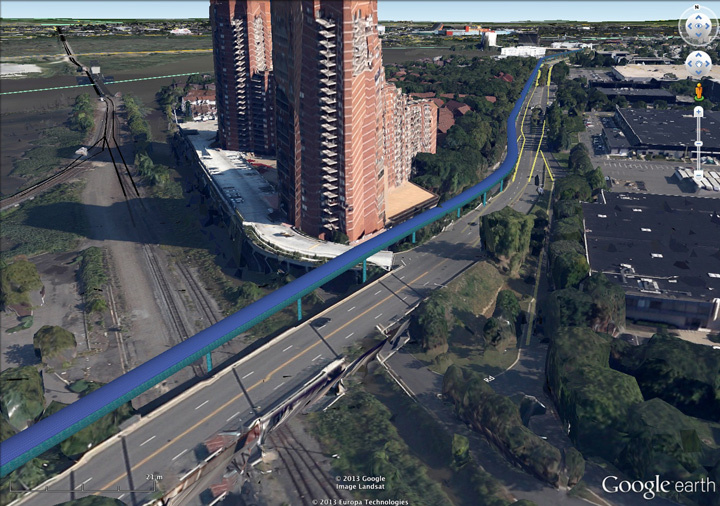 The Secaucus Ordinance 2014-23 uses the well established ASTM standards as the basis of regulation. Constrution must be privately funded. Systems must operate without government subsidies. Efficiency must exceed 120 passenger-miles per gallon. Safety must exceed transport modes already granted use of rights of way. Environmental approvals will be based on energy saved relative to modes already granted use of rights of way. Regulation will be by theme park standards (ASTM Technical Committee F24) with a safety record thousands of times better than highways. 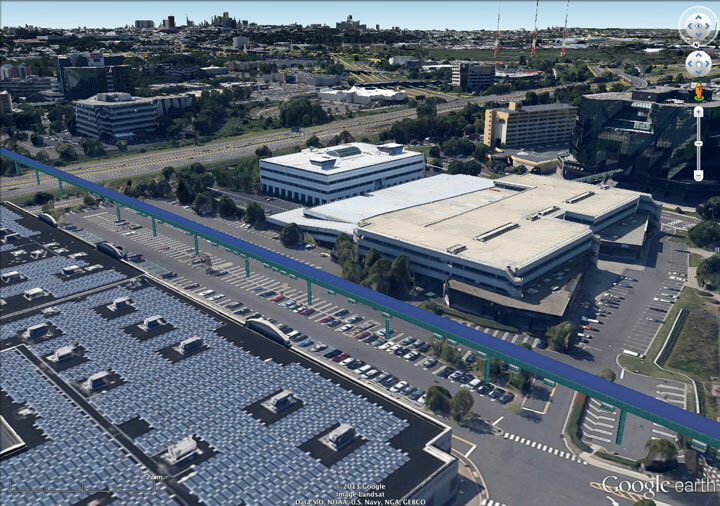 Because of the leadership in Secaucus, JPods will start building a mobility infrastructure with access to all, regardless of age, ability, or wealth. People and cargo can move on-demand without congestion. Each pod in the network will exceed 260 passenger-miles/gallon, won't emit green house gases, and will be 1000 times safer than traveling in cars on the streets below. In 2007 the New Jersey Department of Transportation commisioned a study titled "Viability of Personal Rapid Transit In New Jersey". The study concluded PRT has the potential to provide a higher level of personal mobility than comparable transit modes at a potentially reduced capital and operating cost. It also holds the promise of being potentially more energy efficient, less land consumptive and more environmentally responsible while improving the overall service, speed and attractiveness of public transportation. The study also identified the need for sustained political support to allow for the development and placement of such a unique mode of transportation.